Mikao Usui was a Tendai Buddhist living in Japan in the early 1900�s. It is said that his business and personal life were collapsing around him when he made the important, life-changing decision to seek spiritual guidance; a quest that led him to a unique discovery. Tendai is said to be a more mystical sect of Japanese Buddhism that embraces the practices of mediation and spiritual healing. Inspired by his faith, Usui set out to climb the sacred mountain of Kurama just twelve miles north of the ancient capital of Kyoto. He planned to fast for twenty-one days on Kurama; resting his body and his mind in the ancient cedar forest that envelopes the 8th century Temple at the top of the mountain. At the end of his fast Usui spoke of having a vision, one that became the basis of his teachings; a new healing modality that we call Reiki today. Reiki was brought to the United States not long after by Mrs. Takata. Some seven decades later Usui�s energy based healing modality is accepted at recognized hospitals throughout the United States, the first being in New England at the Portsmouth Hospital in Portsmouth, NH; the Children�s Hospital in Boston, MA; and many other institutions nationwide, with some specifically funded by the Congress of the United States. Numerous hospitals retain Reiki Healers on staff; working at the side of traditional medical professionals. The results derived from these healing treatments have been quantified in scientific studies that continue today. Deborah followed Usui’s journey; climbing the mountain in the summer of 2006 in 110 degree hot, humid heat despite he r life-long disease of asthma. “Reiki works,” Deborah said. “And I am the proof!” In 2002 her asthma had become disabling. She was encouraged by her guides in Spirit to take a course in Reiki. Attending classes presented by the Reiki Healing Connection in New Hampshire she eventually became a Reiki Master and Practitioner. “I was on seventeen drugs a day; taking 40 mg. of prednisone and other steroids just to breathe. 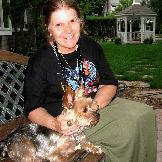 My peak flow meter was giving me readings of under 250 where my normal breathing or personal best was 600.” Within six months of using her newly acquired skills at Reiki, Deborah had stopped all but three of her medications and has been steroid free; her symptoms of asthma mitigated completely since starting Reiki in early 2002.